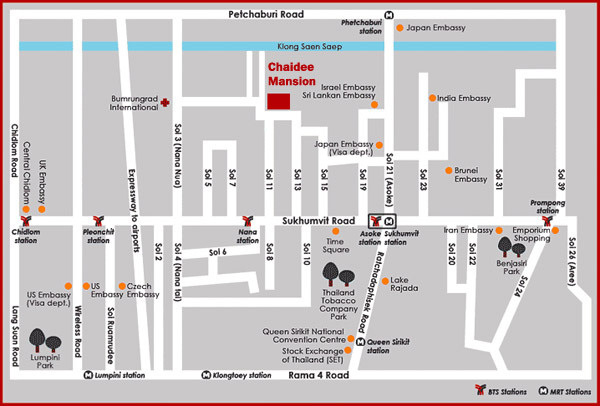 Located in the heart of downtown Bangkok, Chaidee Mansion sits in the middle of the prime business, residential and commercial area of Sukhumvit Road. Sukhumvit Soi 11 gives you access to both Skytrain BTS and underground MRT stations for travels to the main attractions in Bangkok without having to experience the horrendous Bangkok traffic. From fine dining to casual restaurant, high-end shopping complexes to street vendors, Chaidee Mansion is within a comfortable stroll. Use our interactive map to see our exact location and explore the neighborhood.